Have I got a thing for bright lipsticks, HELLO! But sometimes I don’t want the hassle they can bring. Sometimes I just want something easy and effortless on my lips — something like the perfect pink. That’s where today’s entrant in the MAC Unsung Heroes series shines. She’s MAC Viva Glam V lipstick ($14), and she happens to be one of the most wearable neutral pink lippies I’ve ever met. Shimmery like a pearl and with a shiny finish, the color’s one Goldilocks (of Three Bears fame) would love, because it’s not too cool or too warm. It’s one of those products that seems to be juuuust right for almost everyone. And it doesn’t just look good on the lips; it feels good, too — rather, it makes me feel good to wear. 🙂 Since its introduction (Viva Glam V came out in 2004), the proceeds from its sale and those of MAC’s other Viva Glam lipsticks have gone to support men, women and children living with HIV/AIDS. Millions have been raised since the program’s start in 1994, much of it one tube at a time. Nice! I this you’ll like this a lot. Not only is the color super pretty, the texture’s very silky, too. I think Korres is though! GORG. I’m always looking for lovely neutral colours with that special WHAM factor. Fresh faced vixen! You’ll love this to pieces, then! BTW, do you have Nympehtte? Ooh, I have that and I love it. It’s one of the first lipsticks my neutral-loving self has felt really comfortable in. And I too have found Nymphette to be a perfect complement! .-= Amber’s last blog post… Six- and eight-legged farm friends =-. Yes!! Paired together the two are a little piece of lipstick/lipgloss heaven. Holy heck, she looks gorgeous on you! I’ve been meaning to go pick out a Viva Glam for ages, but just haven’t gotten around to it. I can definitely see how V would pair gorgeously with Nymphette! .-= Rae’s last blog post… Eat less: brilliant idea, guys. =-. You gotta do it…and then rock this color with a smokey eye. Woot! Wow that lippie is super pretty on you! .-= Lindsay’s last blog post… FOTD MAC To the Beach Look =-. .-= makeup morsels’s last blog post… More Cool Makeup From Ellis Faas =-. They go great together, like cookies and milk. .-= Agnes’s last blog post… Annabelle Pigments – Karma & Azure + Giveaway comment =-. .-= gio’s last blog post… Sunday Beauty Reads, 06/06/10 =-. .-= Rita L.’s last blog post… Iâ€™ve been tagged +++ =-. Awesome! Let me know what you think about it once you get it. .-= knownever’s last blog post… War Paint =-. Bummer about your lipstick. Hopefully you’ll love this! I’ve been told by MAC associates that this is their #1 selling lipstick shade worldwide! I’ve always been meaning to try it.. This lipstick look definitely is smashing to the nth level when paired with VGV lipgloss. .-= pia’s last blog post… Somekind of Safety Blanket =-. Ooou…this color is very pretty! I might have to pick it up! I hope you love it. Oh, and if you do there’s a matching lip gloss, too. 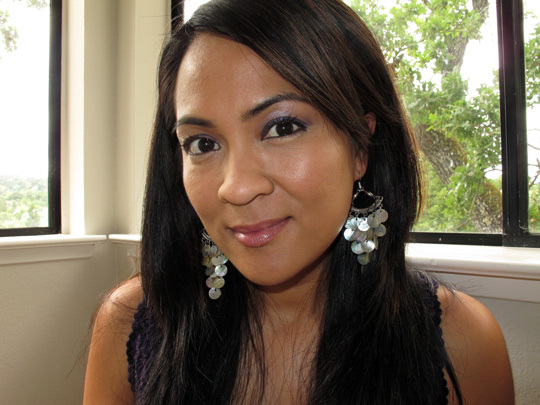 .-= Arianne’s last blog post… A Brow Story, featuring Benefit Brow Zings. =-. Such a pretty shade! I have it and it’s probably one of my faves from all the MAC lippies I own. Ahh I JUST bought Viva Glam V lipglass on Friday! I tried on the lipstick but it looked just like my natural lip color, so the MA thought the lipglass would be more noticeable. She was right- I have it on right now, too! I also bought Prrrr, but I think I like V better. That is a very gorgeous pinky colour. 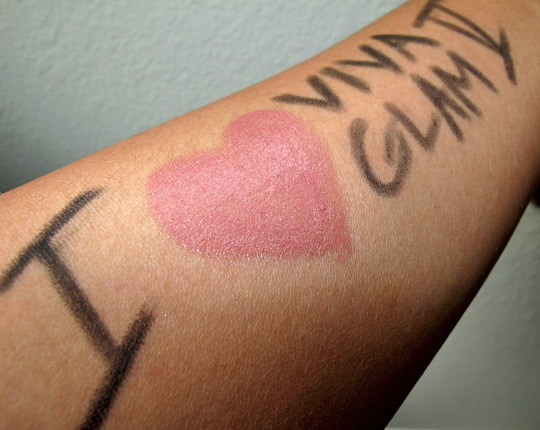 I have Viva Glam VI Fergie edition but now I want this one too. Looking beautiful as always, dear =) Great review! Thanks, Anna! Have a great week! I bought this lipstick yesterday and I love it! Most of my lipsticks are so bold, and I was in dire need of a pretty neutral pink. I love that I can wear it at work (because let’s face it, Russian Red is a little too intense for a labcoat and khakis) and get the sparkle without so much drama. .-= Deb’s last blog post… Starburst Sour/Sweet =-. LOVE Viva Glam V. One of my absolute favorite lipsticks. It’s so versatile! How would this lipstick look on a fair gal like me??? It’s so pretty!! !